The company was founded in the year 1934 in Australia. For a few years ago, they have been building racing motorcycles. They have won many of the titles in world motorcycle championship. All the awards are the proof of their technical expertise. They give many street bikes to the motorcycle world. KTM Bikes are less expensive and are easier to maintain. Bajaj-KTM announced that the company planning to begin the domestic delivery of Ktm Duke 390 by the end of September this year. The launch of this model could be called the most hyped bike launch in India. From the exterior view it is quite similar to its last 200cc model. Some extra parts are added like hand-guards. The joint-venture of these two company designates of about 2 lakh units of this model. The Ktm Duke 390 Price is Rs.1,80,000 (Ex-Show Room New Delhi). It borrows its styling bits and cycle parts from the last 200cc model but on an overall it will be a complete different machine. The manufacturers have given it a lightweight body as they used very less amount of body panel. Ktm Duke 390 Features a single-cylinder, 4-stroke, spark-ignition engine with a liquid-cooling system. The engine got an overall displacement of 372cc. It produces a maximum power output of 44bhp at 9500 rotation per minute and a peck torque is of 35 Nm at 7250 rotation per minute. It is equipped with an electric starter kit for adding in a smooth start of the engine. This vehicle is expected to come up with an impressive mileage. It is blessed with a dual set of tubeless tyres on both front and rear wheels. Both the wheels are of alloy as modern day standard. The wheel size is of 110/70*17mm and 150/60*17 of front and rear wheel respectively. It has wider and fatter tyres that keeps the vehicle on the tracks very perfectly. While going over the wet and slippery surfaces it will not go out of control. Bellow the seat it has got an unloaded hight of 800mm from the ground. 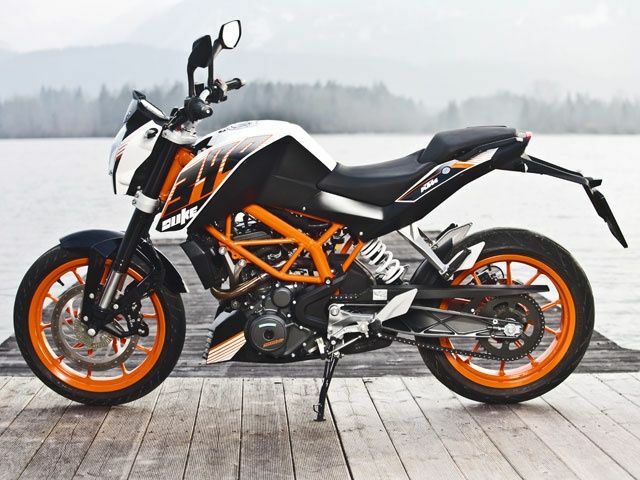 Ktm Duke 390 Pictures show that the company has done an awesome job to make it one of the most handsome two wheelers. The projector head-lamp at the front with turn indicator at both the sides of its head, which gives it an amazing and bold look. It is available in three different colours out of which the orange colour job over the alloy wheels, gives it a stunning look.